"Almanac for the year 1552 after the birth of Christ our Savior, which is a leap year. 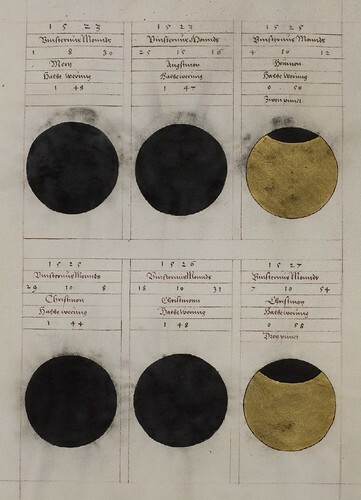 The golden number is 14, the sun circle 21, the Roman tax number 10*, the first Sunday-[C] lasts until the 21st of Hornungs. The other Sunday-[B] lasts until the end of the year. Between Christmas and the Lord's "Night of Fasting" (Ash Wednesday eve), are 9 weeks 2 days. 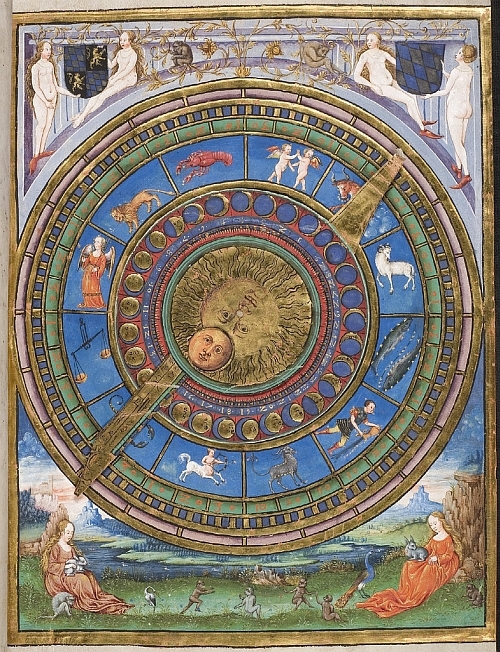 The calendar shows the other festivals, movable and immovable, and also the course of the moon and other necessary observations are interpreted with following characters or signs." Count Otto-Henry (Otto-Heinrich or more usually, Ottheinrich) (1502-1559) was a memeber of the Wittelsbach dynasty of Bavarian Germany. A small territory was created around Neuburg on the Rhine River not long after Ottheinrich's birth which became his principality within the (very) convoluted Palatinate region of the Holy Roman Empire. Ottheinrich was a keen supporter of the arts and sciences and a convert to the Lutheran Reformation which he championed in his hereditary homelands. He was also an avid bibliophile, becoming the most important collector of books of the German Renaissance. 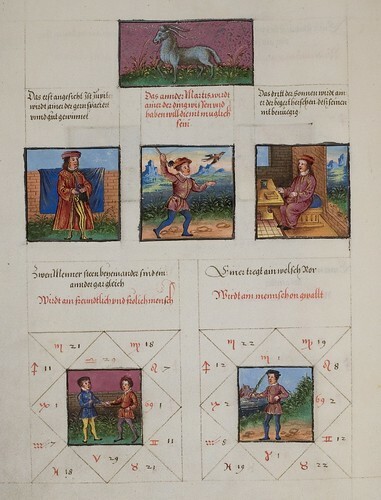 His extravagant outlays on manuscripts and books (and castle building) in Neuburg left him bankrupt in the 1540s and he went into exile (still expanding his private library) for some ten years when his debts had to be paid by the people of his principality. In 1556 his fortunes were reversed after a relative died and he became Prince Elector of the Palatinate. Now in Heidelberg, Ottheinrich set about renovating the university with the help of the humanist Phillip Melanchthon, and he also added an elaborate wing to his newly inherited Heidelberg Castle. As a consequence, his own library from the castle (which now included the exquisite manuscript output of the Lorsch Monastery) was relocated and combined with the university holdings and opened to the public - later becoming known as 'Bibliotheca Palatina' - in the Church of the Holy Spirit. By the end of 1556 the holdings consisted of "6,400 titles, including 4,800 prints, 500 parchment manuscripts and 600 paper manuscripts". 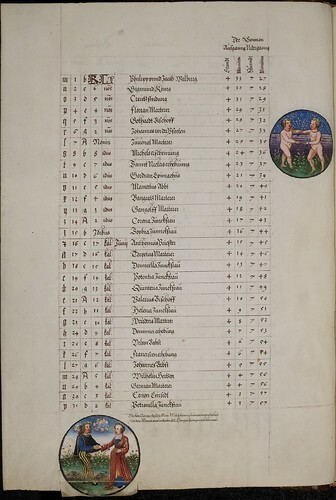 Either because of his fervent belief in the Reformation or his unabated passion for book collecting or because of the sad realisation that he had not produced an heir (or more likely: a combination of all three), Ottheinrich left specific provisions in his will for the expansion and development of the library which had its peak by the end of the 16th century. Alas, the Thirty Years War intervened and the Catholic League took over Heidelberg in the 1620s. This led to the entire collection (apart from the books destroyed during the seige/sacking of the city) of over 3,500 manuscripts and some 13,000 printed works being appropriated by the victors in the name of the Vatican. They were transported to Munich by wagons and then taken across the Alps on mules for delivery to the Pope. Most works are still in Rome but some of the collection (about ninety items) was returned to Heidelberg in the early 19th century. 'Geomantie' Cod. Pal. 833 Ger. is hosted by Heidelberg University: click 'Einband vorne' (front cover) and then the '-' sign at the top of the page for thumbnail views. [The elaborate binding with its clasps and embossing was used as the model for an extravagant (and very expensive) facsimile edition of the Ottheinrich Bible (I recently noted the sale of the original for squillions at Sothebys)]. 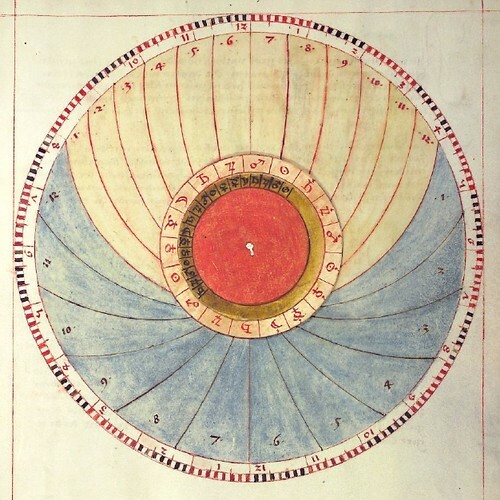 The outstanding 'Geomantie' parchment manuscript of about one hundred pages is more a combination of astrological/astronomical treatise, religious almanac and prediction calendar. 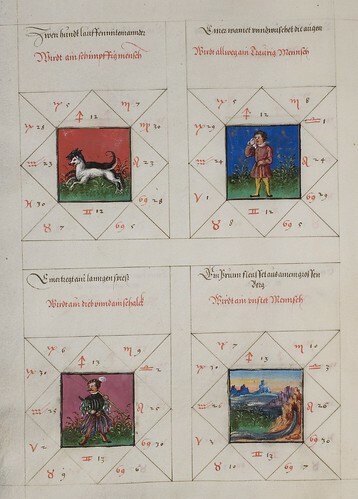 About one half of it is directly copied from a manuscript known as the 'Schicksalsbuch' (Book of Destiny) which was produced in the 1490s and is itself an assemblage of various astrological works. 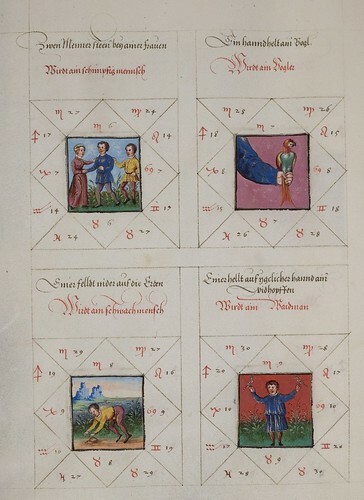 The images below of moveable disks (volvelle) are from the 'Schicksalsbuch', which is much longer than the 'Geomantie' manuscript. 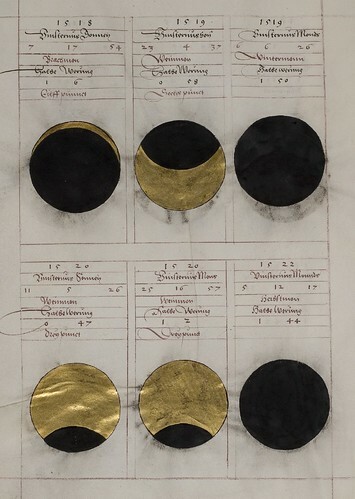 The spectacular full page images up at the top (there are only two) and those below are all volvelles (rotating paper wheel charts) and were used for various computations such as calculating the time and the lunar phases. 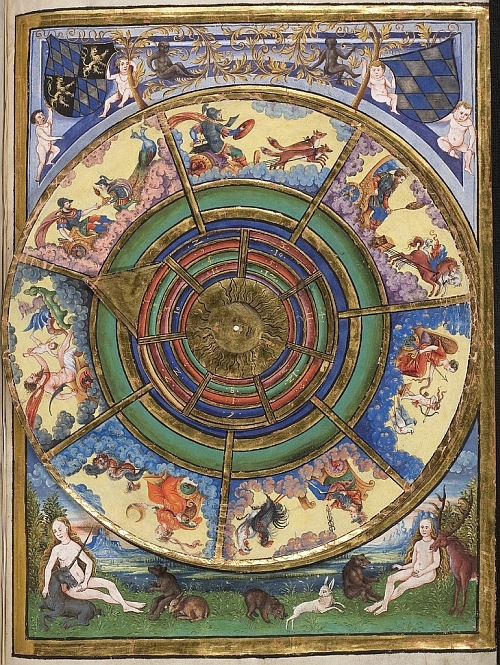 The zodiac images on the wheels could be aligned with the night sky and the disk turned to reveal desired incremental measurements. Some were able to function as astrolabes, to give approximate positions of ships at sea. For those who read German, there is quite a lot of information related to 'Geomantie' and Ottheinrich online. For the rest of us there are bits and pieces. I am greatly indebted to the translation assistance and thoughts provided by John D of Yale University and Kristine. Thank you! No doubt I've not really done their input justice. Heidelberger 'Schicksalsbuch': Cod. Pal. germ. 832 at the University of Heidelberg (wikipedia has chapter title translations - this is of assistance to compare it with the 'Geomantie' manuscript. 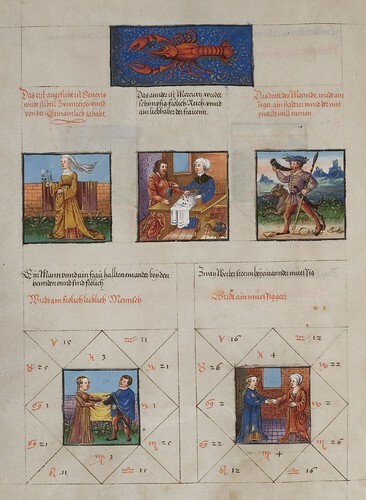 Wolfgang Metzger has three in-depth (German) articles relating to Ottheinrich and 'Bibliotheca Palatina'. Page 38 of this German pdf (5.8 Mb) has an article about 'Geomantie' by Armin Schlechter. Wonderful job! I'm a journalist and I would like to write a piece regarding your web and book. But....no. I spent maybe 30hrs on this post and you expect me to chase you down - someone I don't know - for endorsement? Citizen, go the extra mile. Use your magic journalistic skills and find my email address. OOOK. Don't get angry. I will search for your address. I like looking for things, specially books, -that's why I also work in a bookshop-... and considering the quality of your work, your answer seems fair to me. So, let's see if I manage to contact you. I'm not angry at all. It's more along the lines of disbelief. ...despite it being less 'polished' overall. I love the fact that it really looks like it was meant to be used. To me, that has much more charm than a book that was designed just to look beautiful. Yet, this is beautiful as well. Absolutely fascinating, beautiful and well-researched...thank you. Small correction: you say "It's hard to underestimate the importance of his contributions" --no doubt you meant overestimate? Obviously I have overestimated my proofreading skills! Thanks kyra. Fixed. Antinous, I'm always in two minds about that - whether keeping things sacred and pristine ought to be favoured over free range access. I guess it all depends on the specific document. At least the web addresses this quandary to an extent. And the only smudge marks are left on our own screens. Porlatangente, maybe I woke up on the wrong side of the bed and was a little harsh in my response. Present evidence to the contrary perhaps, but I'm generally a fairly easy going bloke. Wow. Outstanding. Thank you so much. I will enjoy spending much time with this site, investigating links and marveling at the art. I wrote a book called The Playing Card Oracles, A Source Book for Divination, which incorporates the geomancie of lines and starres, the numbers and planetary correspondences, and also the figure repeated several times on your site (of the square within the square within the square again) which I coined "the mystic square". There is a rudimentary site up for the book, www.anacortez.org. Absolutely stunning. Especially those pages with the black and gold discs. They take your breath away. Thanks for another beautiful post. 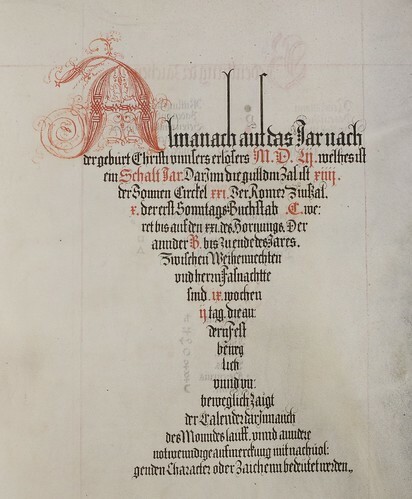 "[I'm thinking of adopting him as the official patron of BibliOdyssey: Ottheinrich has inadvertently contributed to a whole bunch of posts here]"
ooo, that would be interesting: the patron (saints?) of bibliodyssey! not that you don't already have enough to do, but i really enjoyed hearing about this small thread that joins many posts. What a great post. I love your blog. I was looking for a link to amazon, to buy "Reinventing the Wheel" by Jessica Helfand. 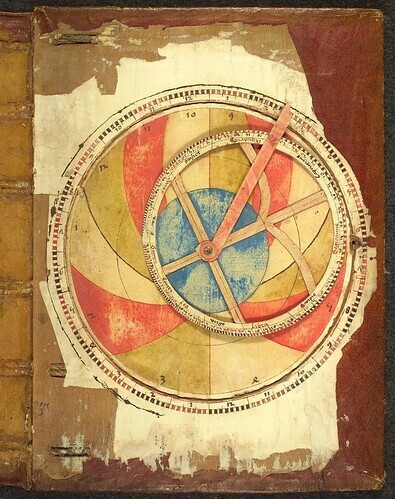 It's a book about volvelles (wheel charts) in the 20th century. I thought if I clicked through to Amazon you would get a tiny cut of the sale. Couldn't find the link though. Is it me? I did click on another book to get to Amazon. Maybe that works? Thanks Judith. 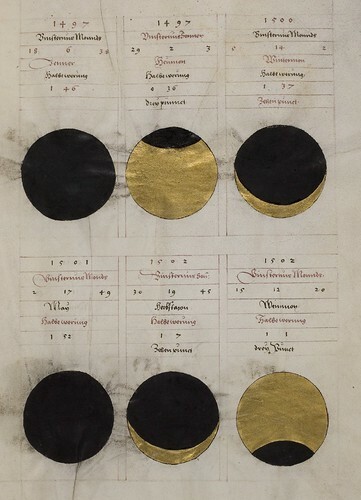 The Jessica Helfland (from Design Observer fame) book is the basis of that first volvelle link above to the Robert Sabuda site. 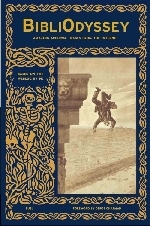 But, yes, if you click through on any Amazon link from BibliOdyssey and then search for the Helfland book, you will be doing me a favour, thanks very much. 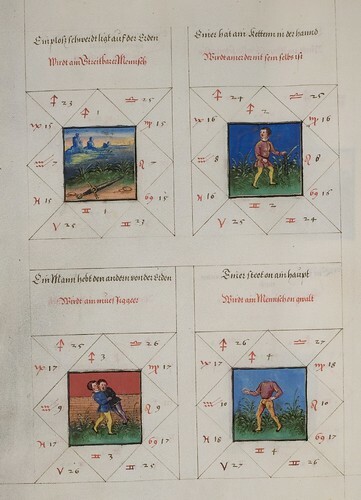 Also see 'Losbuch' (Cod. Pal. germ. 332) from 1492 --- this has a lot of very intriguing hand drawn geomantic 'wheels': I only had a quick look but there were 'wheels' with, for instance, earth air water fire (and more I didn't know to make up about 10 segments of the 'wheel') and others with apostles and muses plus alchemical and astrological signs or names that make up the segments. Oddly much. the alst picture of the paper asrolabe where was it found? Evan, from the Heidelberger 'Schicksalsbuch'. Beautiful, thanks for putting these up.